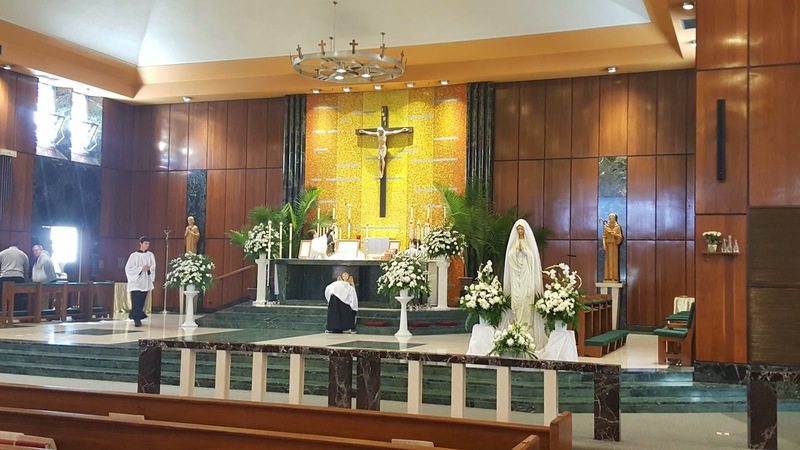 Compared to all other cities in the United States, Chicago has more Tridentine Latin Masses each Sunday than anywhere else. 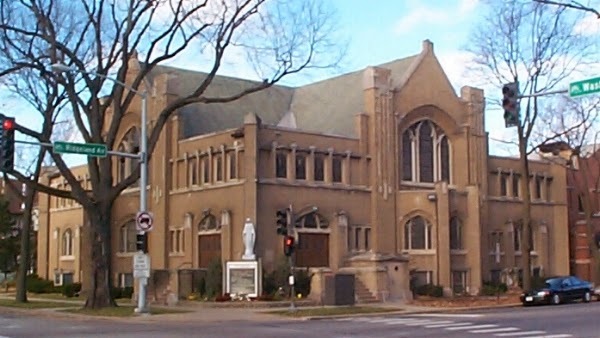 In fact, Chicago serves as an important base for the Institute of Christ the King Sovereign Priest, a traditional religious order that only offers the Traditional Mass, with most of their US apostolates in driving distance from Chicago. St. John Cantius is known as one of the gems of Catholic Tradition in the Conciliar Church. The building itself has a rich history - it was saved from near closing and has blossomed into a community of vibrant Faith, Tradition, and Devotion. The building is known for its beauty, the Liturgies are among some of the most ornate in the City, and the use of Sacred Polyphany and Orchestral High Masses make this a truly unique parish of Chicago. 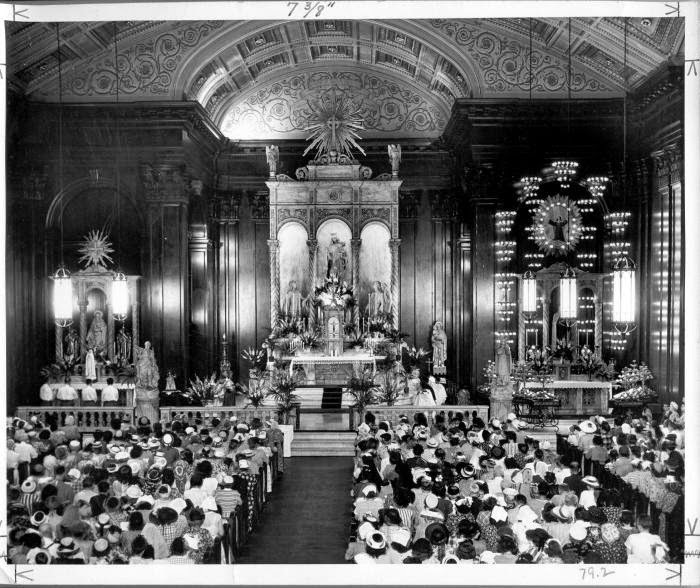 The Shrine, like St. John Cantius, was near closing - in fact, the Shrine of Christ the King was slated for demolition after a fire ravished the building. 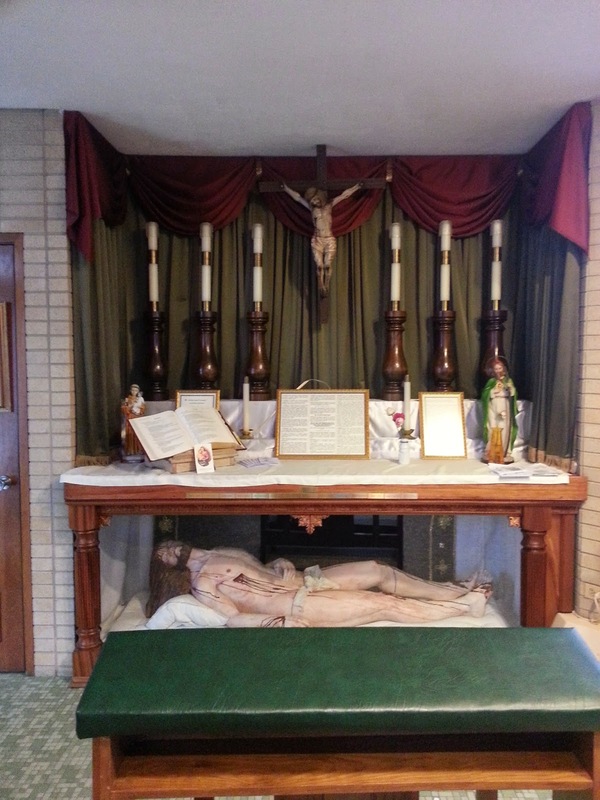 As the neighbor decayed, the former St. Gelatius Church, which was home to the National Novena to St. Therese on each Tuesday of the week, was all but certainly lost. In 2006, the building was entrusted to the Institute of Christ the King by then Cardinal of Chicago, Cardinal George. 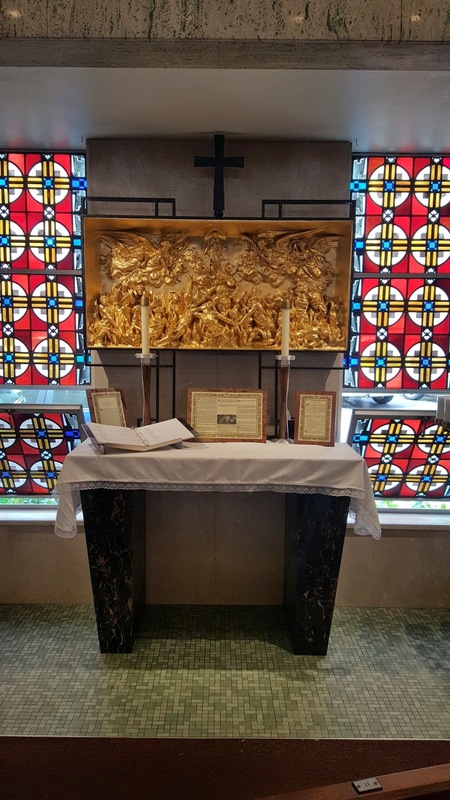 As a result of the order's dedication, the building is being restored and the Faithful who attend the Shrine assist at one of the few locations to only offer Tridentine Masses - even during the Triduum. 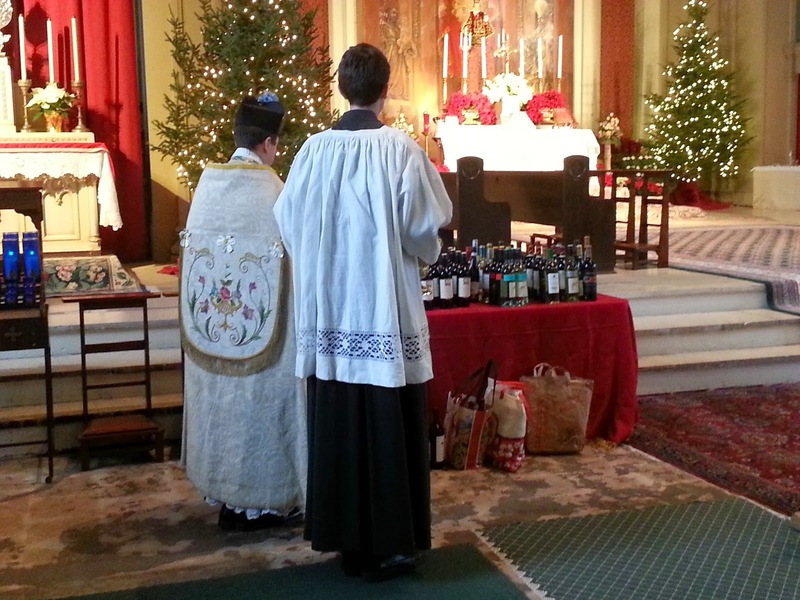 The Order's use of traditions ranging from Candlemas Processions, Blessings of Wine on the Feast of St. John, Blessings of Epiphany Water, and the like make this one of the few places to regularly and publicly use the Rituale Romanum. The vibrant parish life offers several weekly evening Masses as well as Masses in the evening usually on all 1st Class Feasts, which is a true rarity! With powerful preaching and doctrinally sound catechesis, the Shrine of Christ the King has earned a place in our Top 5 List. St. Mary of Perpetual Help is a remarkable structure visible from Interstate 55. Its huge dome pierces the skyline of the south side of Chicago in the Bridgeport neighbor and calls all to honor Almighty God. The Church offers a weekly Tridentine High Mass on Sundays at 8:30 AM, the earliest Tridentine High Mass offered on a Sunday in the city. The inside of the Church is vibrantly beautiful with many statues, icons, and images. 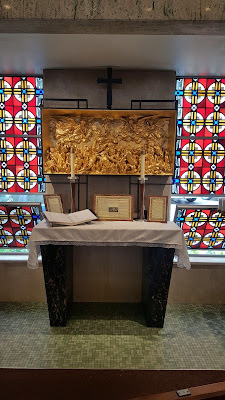 The high altar of the Church is one of the most grand high altars in Chicago and made of some of the highest quality marble - only St. Adalberts Church might claim to have higher quality marble (though no Tridentine Mass is offered there). St. Mary's offers Confession before each Mass that are infrequently attended making it quick and easy to obtain Confession - not a commonality in the more traditional Churches. With beautiful music and clear sermons, this parish could be much busier than it typically is. It's a treasure and all Catholics of Chicago should make their way here for an 8:30 Sunday High Mass. 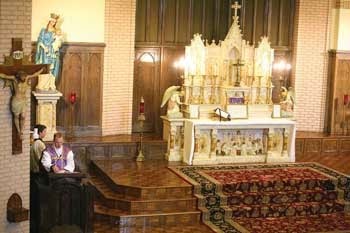 Note: Low altar is removed for all Latin Masses. As the National Shrine of the Poor Souls, the Faithful who attend Mass here receive a particular indulgence. 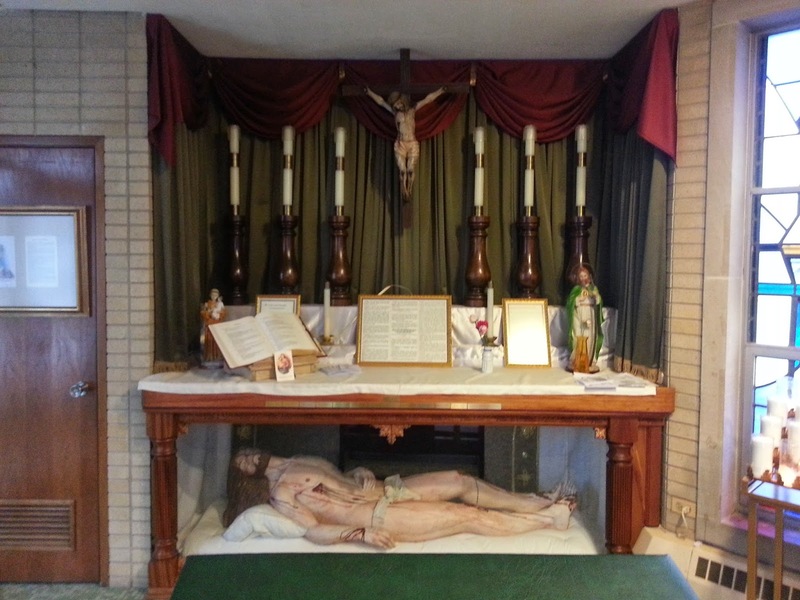 The Church, while featuring some model art and a "low altar", has some truly unique features - a life-sized and bloody depiction of our Lord after he was taken down from the Cross in a separate chapel. 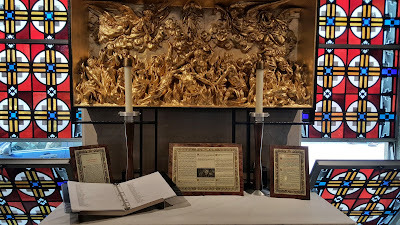 The Church also has sevearl side altars and candles throughout in honor of the Poor Souls - you'll see Traditional Altar missals on them as well. 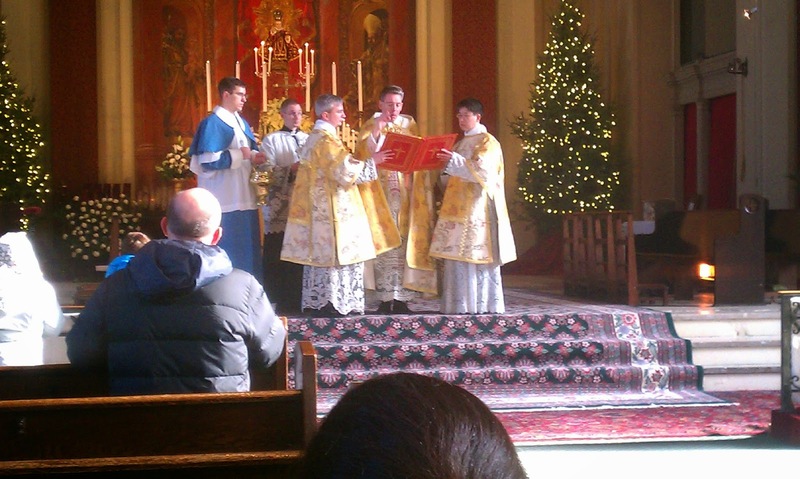 The Church offers a Sunday Tridentine Mass at 9:30 AM and has a very beautiful schola. Only downsize - Confessions are not offered immediately before each Mass, like the other places on this list. But don't let that stop you from making a visit to St. Odilo's and praying for the poor souls at the Sunday Latin High Mass. 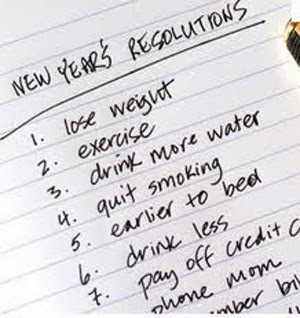 And be ready for Fr. Brankin's inspiring, clear, and unabashedly Catholic sermons. Of all of the sermons offered on a given Sunday at a Tridentine Mass, Fr. Brankin's are among the very best each and every week. 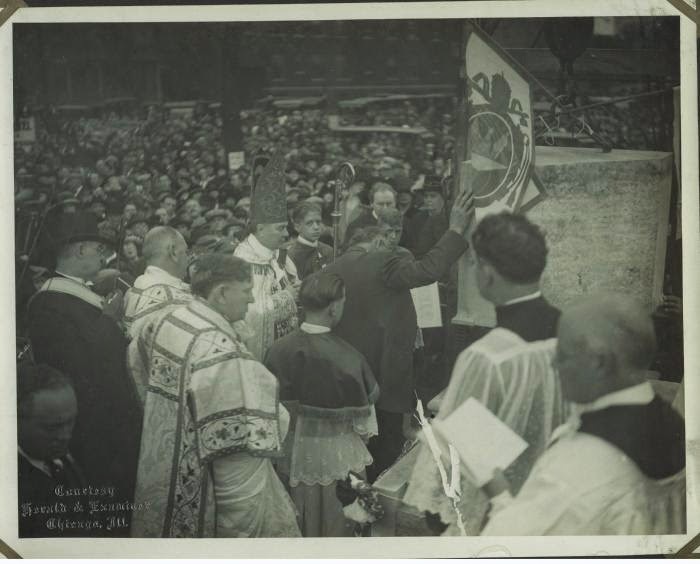 The Society of St. Pius X, founded by Archbishop Marcel Lefebvre, was the catalyst for Traditional Catholicism in the aftermath of the Second Vatican Council. 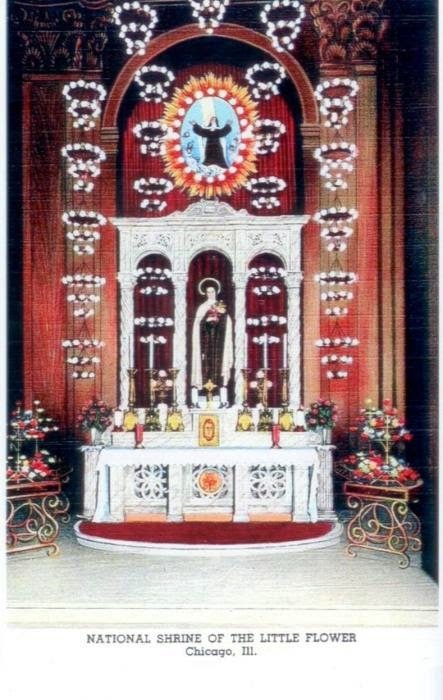 Without the Society, it is likely that the Tridentine Mass would have vanished from the earth. This particular chapel of the Society is located near one of the Society's few priories - this prior is unique as it is the home of one of the four bishops of the Society - Bishop Tissier de Mallerais. The Chapel itself is a former protestant building that has been turned into a Catholic Church. It features an impressive high altar. Unique among the churches of Chicago, it is the only one to regularly feature a blessing of religious articles after both Masses on the Second Sunday of the month. So bring your candles, rosaries, images, and anything else that needs blessed. 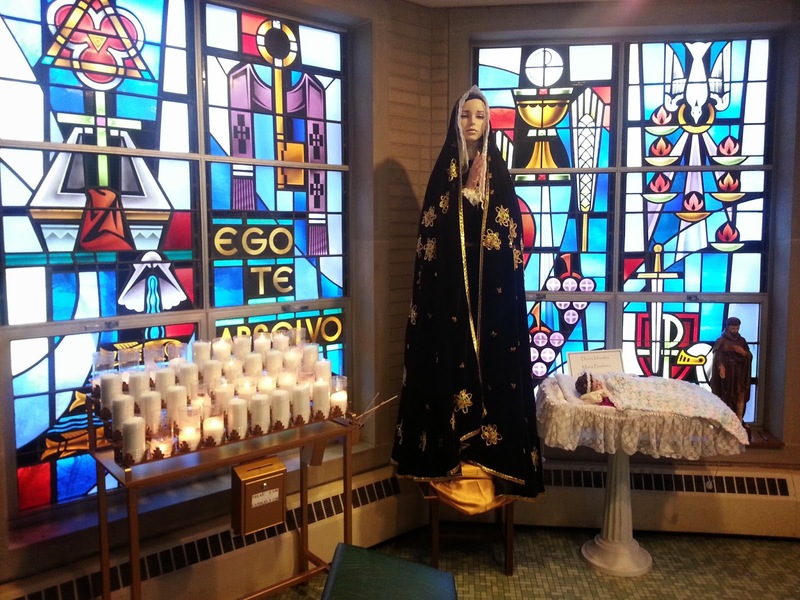 The chapel also has monthly devotions to Our Lady of Sorrows and the pastor is not afraid to speak candidly on the crisis in the world and the need for Catholics to stand up for the Truth. You won't hear any psedu-protestantism here. This chapel is a home for unabasedly Catholic teaching and is home to a truly multicultural congregation of Caucasians, African Americans, Hispanics, Asians, and others - showing that the Church truly transcends cultures. And yet, all come together and worship in a common tongue of Latin. 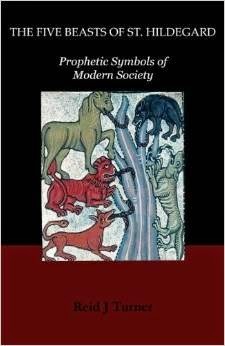 I was recently contacted by the author of a new book entitled The Five Beasts of St. Hildegard: Prophetic Symbols of Modern Society. It's an interpretation of her vision of the last days. There are few books about St. Hildegard that are written from a Catholic perspective. 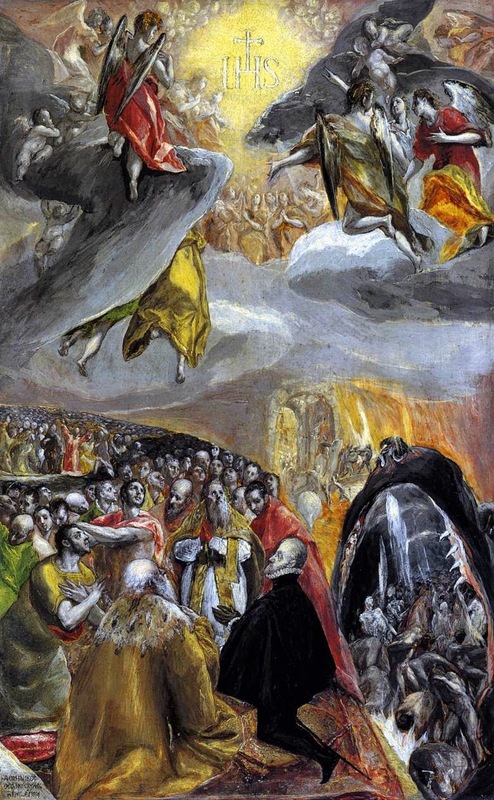 Also the author admits, "Credible books on Catholic prophecy are few as they tend to collect and collate various prophecies, some anonymous, and over-speculate on their meaning. This book takes a single prophecy from an original manuscript and compares it to modern history. I uncover a remarkable resemblance between them." Mr. Turner's work is insightful and compelling. It is an easy read, taking only a few hours to get through. The author approaches his work by presenting the facts, which do show a correlation between the visions of St. Hiledgard and the time leading up to the end of the world. Most importantly, the author does not force these conclusions; rather, he presents objective facts and thereby after establishing facts does he then even attempt to draw a conclusion. All in all, its a good book, presenting the facts which indicate that our world is in the midst of the prophecies of St. Hildegard on the last ages of the world. First Day of the Octave (January 18th) The Feast of St. Peter's Chair at Rome. Intention of the Day: the return of the "other sheep" to the One Fold of Christ. lovingly. Through Christ Our Lord. People: Amen. peace to the world. Amen. lively faith and an ardent zeal so that all of us will labor for the return of our separated brethren. May the desire of Our Divine Redeemer, that there might be but "one Fold and one Shepherd,"
of our common Mother, the Catholic Church. People: Amen. Church, we beg of Thee to inspire them to occupy it again, so as to form with us one single fold. glorify Our Lord Jesus Christ, Thy Son. People: Amen. homage to thee, O Virgin Mother of God, full of grace, now and forever. Amen. 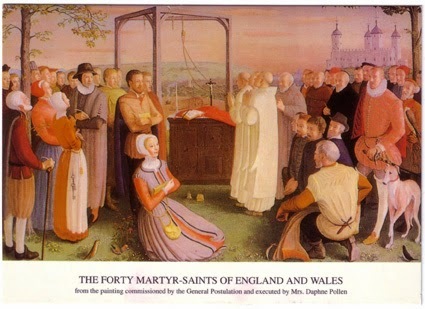 Intention of the day: The conversion of the Anglicans. and Immaculate Mother that it was known throughout Christendom as the "Dowry of Mary." now separated from Thy flock. People: Amen. with Thee in our heavenly home. Amen. it was so cruelly wrested. People: Amen. Intention of the day: That the Lutherans and other Protestants of continental Europe may find their way back to Holy Church. who are still outside Thy Fold, and let the full blaze of the light of Thy truth shine upon them. happiness of Heaven. People: Amen. Father in heaven. People: Amen. 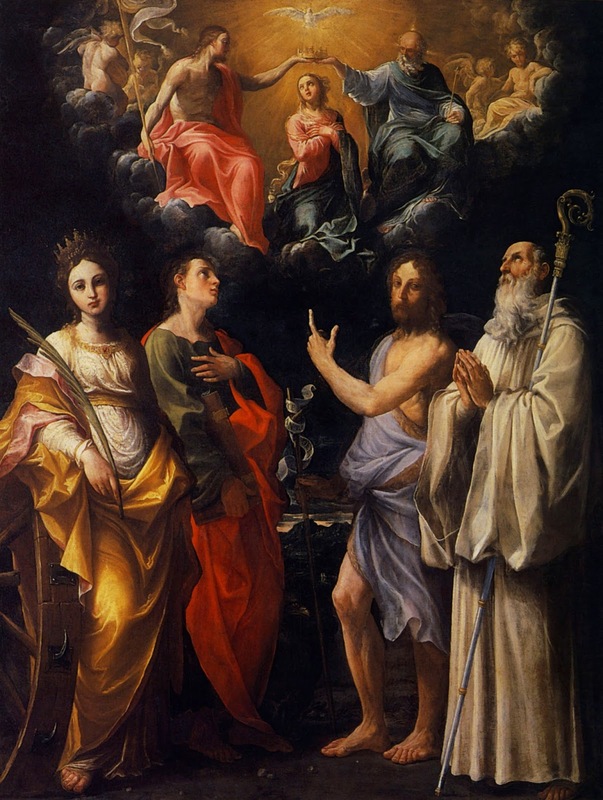 Intention of the Day: That Protestants in America may become one in union with the Chair of Saint Peter. Mother, the benevolent patroness and protectress of our country. People: Amen. now in so many dangers, sing once again the hymn of deliverance, of victory, and of peace. own beloved country. People: Amen. Intention of the Day: The return to the Sacraments of lapsed Catholics. be converted and live pour out upon us thy mercy and listen to the prayers of Thy servants. one day attain everlasting happiness in heaven. People: Amen. Intention of the day: Conversion of the Jews. the way of salvation. People: Amen. forgive them, for they know not what they do." Amen. Intention of the day: The Missionary Conquest of the World for Christ. forever and ever. People: Amen. compassion, look down in pity upon those who have not yet heard the tidings of the Gospel. knowledge of our Holy Faith, and the grace to love, embrace, and to practice it faithfully. those who have not as yet heard the Name of Our Lord and Savior Jesus Christ. People: Amen. For information on today's feast, besides these Proper Prayers, please click here. Behold, the Lord, the Ruler, is come. He has dominion over all, and in His hand is power and might. Ps. 71:2. O God, with Your judgment endow the king, and with Your justice, the kings son. V. Glory be . . . COLLECT - O God, who by the star this day revealed Your only-begotten Son to all nations, grant that we, who know You now by faith, may be brought one day before the vision of Your majesty. Through the same Jesus Christ, our Lord . . .
Arise, be enlightened, O Jerusalem: for thy light is come, and the glory of the Lord is risen upon thee. For behold darkness shall cover the earth, and a mist the people: but the Lord shall arise upon thee, and his glory shall be seen upon thee. And the Gentiles shall walk in thy light, and kings in the brightness of thy rising. Lift up thy eyes round about, and see: all these are gathered together, they are come to thee: thy sons shall come from afar, and thy daughters shall rise up at thy side. Then shalt thou see, and abound, and thy heart shall wonder and be enlarged, when the multitude of the sea shall be converted to thee, the strength of the Gentiles shall come to thee. The multitude of camels shall cover thee, the dromedaries of Madian and Epha: all they from Saba shall come, bringing gold and frankincense: and shewing forth praise to the Lord. All they from Saba shall come, bringing gold and frankincense, and showing forth praise to the Lord. V. Arise and be enlightened, O Jerusalem, for the glory of the Lord is risen upon you. Alleluia, alleluia. V. Matt. 2:2 We have seen His star in the East and have come with gifts to worship the Lord. Alleluia. Now when Jesus therefore was born in Bethlehem of Juda, in the days of king Herod, behold, there came wise men from the East to Jerusalem, saying: "Where is he that is born king of the Jews? 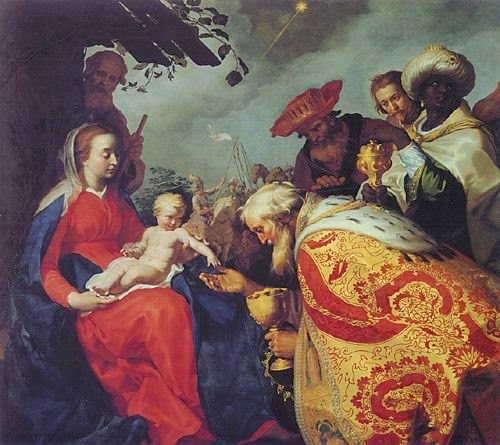 For we have seen his star in the East, and are come to adore him." And king Herod hearing this, was troubled, and all Jerusalem with him. And assembling together all the chief priests and the scribes of the people, he inquired of them where Christ should be born. But they said to him: "In Bethlehem of Juda. For so it is written by the prophet: 'And thou Bethlehem the land of Juda art not the least among the princes of Juda: for out of thee shall come forth the captain that shall rule my people Israel.' " Then Herod, privately calling the wise men learned diligently of them the time of the star which appeared to them; And sending them into Bethlehem, said: Go and diligently inquire after the child, and when you have found him, bring me word again, that I also may come and adore him. Who having heard the king, went their way; and behold the star which they had seen in the East, went before them, until it came and stood over where the child was. And seeing the star they rejoiced with exceeding great joy. And entering into the house, they found the child with Mary his mother, (here, genuflect) and falling down they adored him: and opening their treasures, they offered him gifts; gold, frankincense, and myrrh. And having received an answer in sleep that they should not return to Herod, they went back another way into their country. The kings of Tharsis and the isles shall offer gifts; the kings of Arabia and Saba shall pay Him homage, all nations shall serve Him. 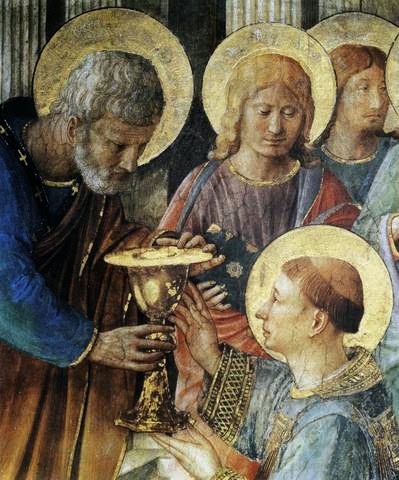 SECRET O Lord, look with favor upon the gifts offered by Your Church. It is not gold, frankincense, and myrrh that is offered now, but the King, God and Saviour, who was signified by these gifts, is Himself our Sacrifice and our Food, Jesus Christ Your Son, our Lord; who lives and rules with You . . .
We have seen His star in the East and have come with gifts to worship the Lord. POST COMMUNION - O Almighty God, grant that we may understand with pure minds the revelation of Christ which we here solemnly commemorate. Through Our Lord . . .
1. Overall, I did well on the first goal. I did not pray the Rosary daily but I did go through periods of time where I did and other weeks I managed to pray it 4-5 times. 3. I made limited progress with this. It is difficult to meet people in person due to timing and a host of other issues. Last year when I was going to, I had situations where I got lost and another one where I got in an accident on the way. But I did made at least electronic contact with more than 10 Traditional Catholics. 4. This goal was met in early August. 5. I did not always make bi-weekly Confession but I did not go more than one month without its reception. 3. Read 3 Books to help improve my own prayer life, with one of them being during Lent (as per the Rule of St. Benedict for his monks). Just as I mentioned yesterday on the Octave Day of St. Stephen, very little information is readily available on the Internet for the celebrations that were part of Catholic Calendar before the 1950s, when changes to the Missal became more profound. 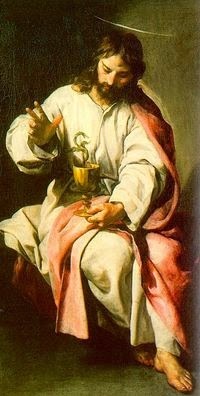 In an effort to make available this spirituality, I will be posting the Traditional Mass Propers for the Octave Day of St. John the Evangelist, which was traditionally celebrated today. Those interested in the Breviary for the Octave Day of St. John should click here. At the name of Jesus every knee should bend of those in heaven, on earth, and under the earth, and every tongue should confess that the Lord Jesus Christ is in the glory of the Father. Ps. 8:2. O Lord, our Lord, how glorious is Your name over all the earth! V. Glory be . . . COLLECT - O God, it was You who conferred the name of Jesus upon Your only-begotten Son, the Savior of the world. Grant that by venerating His holy name on earth we may enjoy His presence in heaven. Through the same Jesus Christ, Your Son, our Lord, who lives and rules with You in the unity of the Holy Spirit, one God forever and ever. In those days, Peter, filled with the Holy Ghost, said to them: "Ye princes of the people and ancients, hear. If we this day are examined concerning the good deed done to the infirm man, by what means he hath been made whole: Be it known to you all and to all the people of Israel, that by the name of our Lord Jesus Christ of Nazareth, whom you crucified, whom God hath raised from the dead, even by him, this man standeth here before you, whole. " This is the stone which was rejected by you the builders, which is become the head of the corner. Neither is there salvation in any other. For there is no other name under heaven given to men, whereby we must be saved." Save us, O Lord our God, and gather us from among the nations that we may give thanks to Your holy name and glory in praising You. V. You, O Lord, are our Father, our Redeemer. From eternity is Your name. Alleluia, alleluia! V. Ps. 144:21 My lips shall speak the praise of the Lord; let all men bless His holy name. Alleluia! 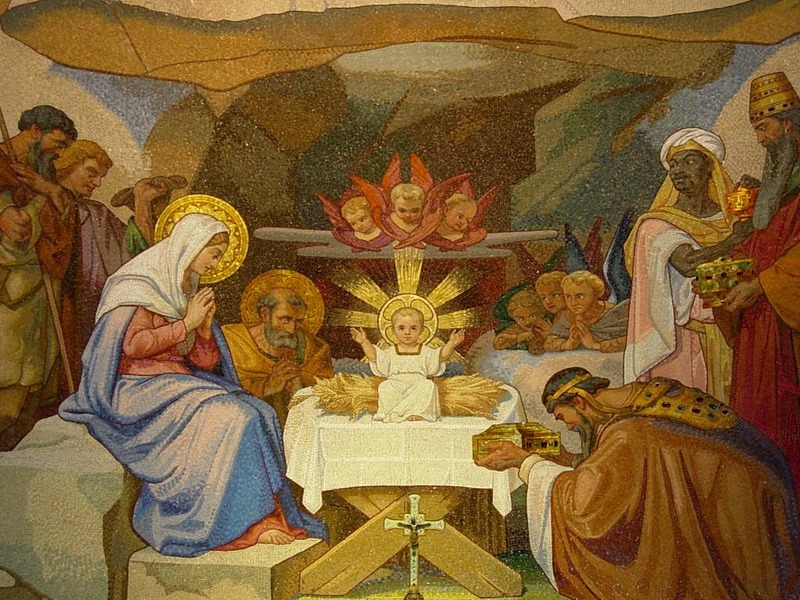 At that time, after eight days were accomplished, that the child should be circumcised, his name was called JESUS, which was called by the angel before he was conceived in the womb. I will praise You, O Lord my God, with all my heart, and I will glorify Your name forever. For You, O Lord, are sweet and mild, abounding in kindness to all who call upon You, alleluia! SECRET May Your blessing, O most merciful God, which makes all creation flourish, sanctify this our sacrifice, which we offer You to the glory of the Name of Your Son, our Lord Jesus Christ, and may it be pleasing to Your majesty as an act of praise and be profitable to us for our salvation. Through the same Jesus Christ, thy Son, Our Lord, Who liveth and reigneth with thee in the unity of the Holy Ghost, God, world without end. R. Amen. All the nations You have made shall come and worship You, O Lord, and glorify Your name. For great You are and do wondrous deeds. You alone are God. Alleluia! POST COMMUNION - O Almighty and eternal God, who created and redeemed us, graciously hear our petitions. Receive kindly and favorably this saving Sacrificial Victim, which we have offered to Your majesty in honor of the name of Your Son, our Lord Jesus Christ. Pour out Your grace upon us, that we may rejoice to see our names written in heaven under the glorious name of Jesus, who is the pledge of our eternal predestination. Through the same Jesus Christ, our Lord . . . 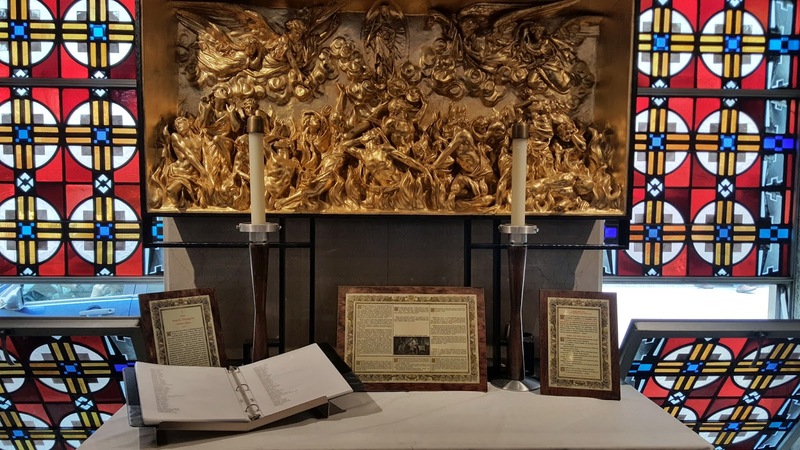 Very little information is readily available on the Internet for the celebrations that were part of the Catholic Calendar before the 1950s when changes to the Missal became more profound. 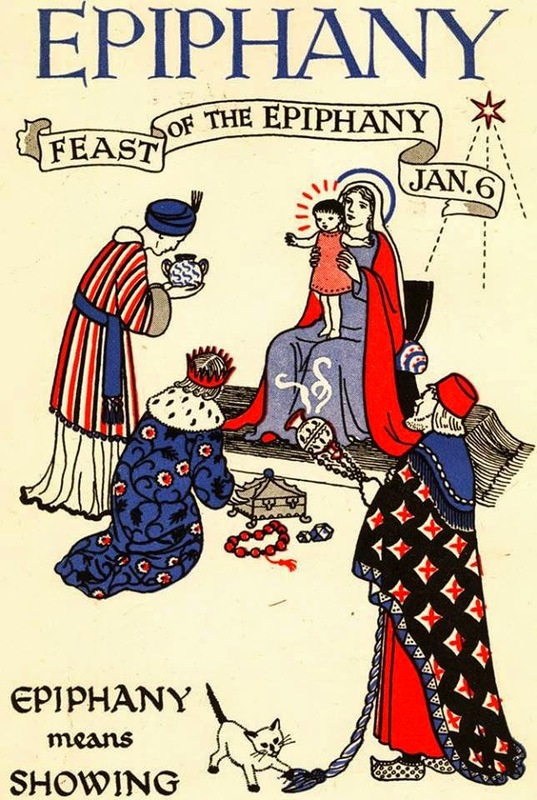 The 1962 Roman Catholic Missal does not include some of these older celebrations (e.g. the Octave Days for all Octaves except Christmas, Pentecost, and Easter). 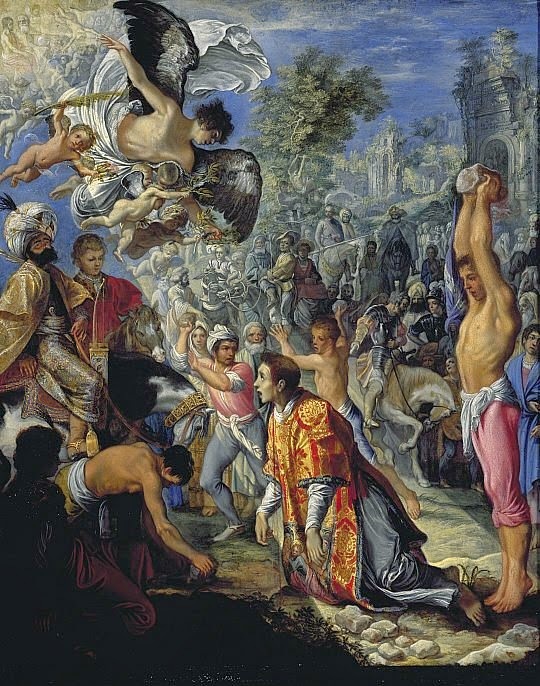 Those interested in the Breviary for the Octave Day of St. Stephen should click here. 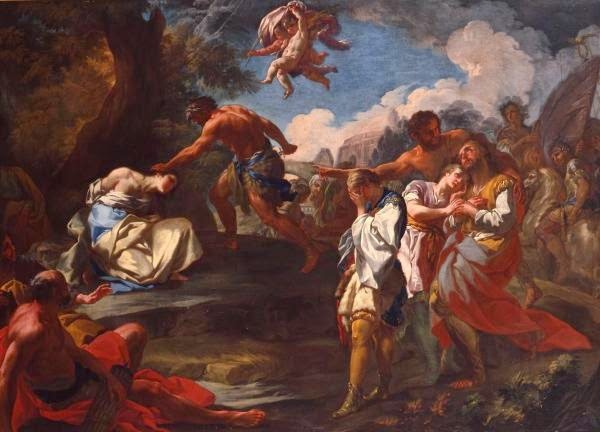 Like St. John the Evangelist and the Holy Innocents, the Octave of St. Stephen was a simple octave. The collect prayer for this Octave was as a result only said on the Octave Day and not on the intervening days within the Octave. 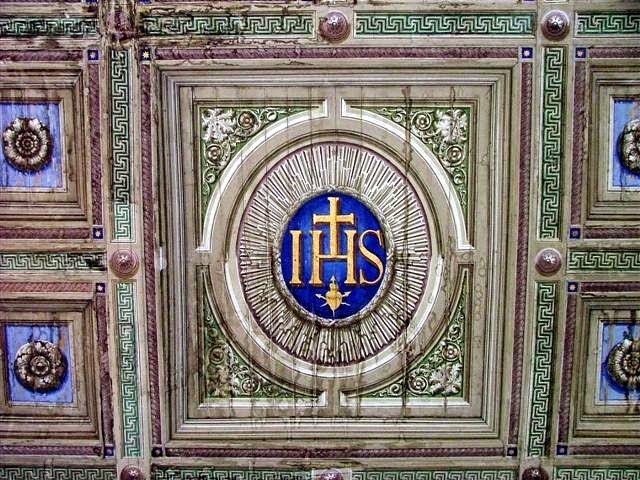 Moreover, since today is the Holy Name of Jesus, the Mass was said for the Holy Name and not said with propers for the Octave of St. Stephen. Rather, a 2nd collect was added for this Octave Day and a commemoration was made during the praying of Lauds. For information on the spirituality and devotions for today's feast, not just the Mass Prayers, please click here. A Child is born to us, and a son is given to us; upon his shoulder is supreme sovereignty, and his name shall be called the Angel of great counsel. Ps. 97:1. Sing a new canticle to the Lord, for He has done wondrous things. COLLECT - O God, it was through the Motherhood of the Blessed Virgin Mary that You bestowed the gift of eternal life upon mankind. Grant that we may feel the powerful intercession of Mary, through whom we were privileged to receive the giver of life, Jesus Christ, Your Son, our Lord; who lives and rules with You . . .
Beloved: The grace of God our Saviour hath appeared to all men: Instructing us, that, denying ungodliness and worldly desires, we should live soberly and justly and godly in this world, looking for the blessed hope and coming of the glory of the great God and our Saviour Jesus Christ. Who gave himself for us, that he might redeem us from all iniquity and might cleanse to himself a people acceptable, a pursuer of good works. These things speak and exhort and rebuke with all authority. Let no man despise thee. All the ends of the earth have seen the salvation of our God. Sing joyfully to God, all the earth. V. The Lord has made His salvation known; in the sight of the nations He has revealed His justice. God, who in divers manners spoke in times past to the fathers by the prophets, last of all in these days has spoken to us by His Son. Alleluia! 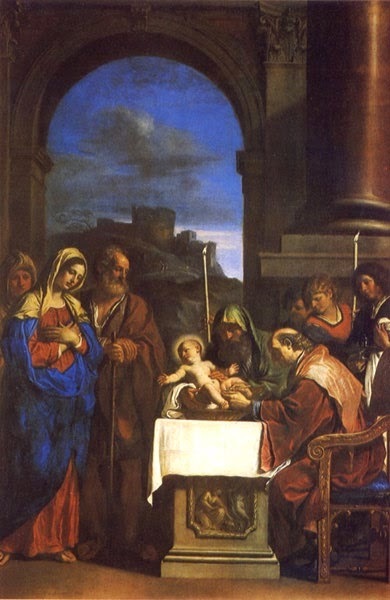 At that time, when eight days were fulfilled for the circumcision of the Child, His name was called Jesus, the name given to Him by the Angel before He was conceived in the womb. Yours are the heavens and Yours are the earth; the world and its fullness You have founded. Justice and judgment are the foundation of Your throne. SECRET - Accept our offerings and prayers, O Lord. Cleanse us by this heavenly rite and in Your mercy hear our petitions. Through Our Lord . . .
POST COMMUNION - O Lord, may this Communion cleanse us from sin, and bestow on us spiritual health from heaven through the intercession of the Blessed Virgin Mary, Mother of God. Through the same Jesus Christ, our Lord . . .